This book is a state-of-the-art educational resource on the latest research and public-policy developments in the fields of wellness promotion and disease prevention. Based on award-winning lectures by University of California faculty on nine campuses as part of the Wellness Lectures Program jointly funded by The California Wellness Foundation, Health Net, and the University of California, the volume aims to widen the scope of health care research and policy to promote wellness rather than focus on illness and disease, and to incorporate proactive, interdisciplinary approaches to health care. The volume also contains chapters by distinguished scholars inthe fields of wellness promotion and disease prevention. Many of these articles fall outside the scope of what we conventionally call health promotion, bringing new perspectives to research and policy possibilities. Promoting Human Wellness is organized around core themes such as the importance of disease prevention programs that address multiple health risks, the link between poverty and minority status and disease susceptibility, and the challenge of evaluating health benefits and cost-effectiveness. The articles discuss such timely issues as genetic determinism as a paradigm in wellness promotion, adolescent health promotion and teen pregnancy prevention strategies, racial differences in cancer epidemiology, the California smokers' helpline, strategies for reducing youth violence, HIV/AIDS prevention, domestic violence education and prevention srategies, and the future of women's health research. Presented within the framework of social ecology, several of the chapters in this volume address new ideas and approaches in the wellness field that are only now beginning to be understood such as the social construction of variables including race, class, and gender. 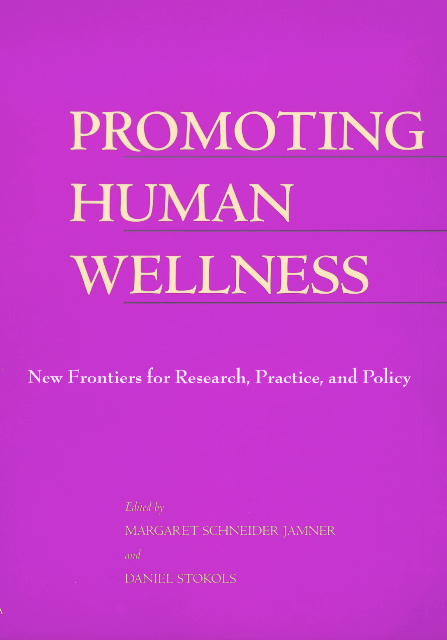 Promoting Human Wellness will be essential reading for health practitioners, policymakers, and others seeking to expand the ways we define and achieve health. Keywords: Public health, community health, medicine, nursing, social welfare, health education, health psychology, social ecology, public policy, aging, health promotion. Margaret Schneider Jamner is a Research Associate at the School of Social Ecology at the University of California, Irvine. Daniel Stokols is Professor and Dean Emeritus of the School of Social Ecology at the University of California, Irvine.